Transport Located in Bayswater, close to Hyde Park and Oxford Street with Lancaster Gate underground station just a few minutes walk . Paddington station is half kilometre away. Main bus routes include numbers 12, 94 and A2 airbus. Marble Arch is a stone's throw. Description This superb tourist hotel is a grade 11 listed townhouse building and was built in the middle of the 19th Century. 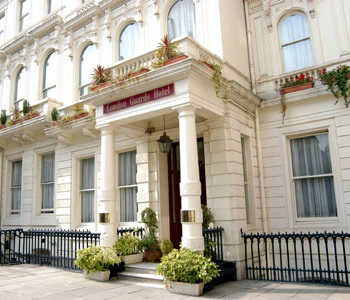 This self appointed 3 diamond hotel is ideally situated in a quiet location behind Hyde Park and yet only a few minutes walk from the bustle of the famous shopping area of Oxford Street. The hotel has recently undergone extensive refurbishment and comprises 40 individually designed bedrooms all with private bathrooms and fully air conditioned. The hotel also has a licensed bar and coffee shop. Minimum 2 night stay over Friday and Saturday. Please note that the above rates are per room per night and include taxes. Our comments We have known the hotel owners for many years and they take great pride in their hotel providing an exemplary service. Take advantage of the heavily discounted special rates we offer you. We highly recommend this hotel as excellent value for money.